What is the state of the science regarding the connections between sleep and digital media use? How does digital media use effect circadian rhythms? There is a tremendous connection, not only between media use and sleep, but more generally, between light exposure and sleep. For the past century, kids have been losing about 2 minutes of nightly sleep per year; that is, today’s children sleep about 2 hours less of sleep each night than those of yesteryear. (This data comes from studies of 700,000 – 800,000 children.) The impact of sleep deficiency manifests differently in children and adults. In children, the symptoms of sleep deficiency masquerade as the same types of symptoms as ADHD and other psychiatric illnesses. The treatments for those non-sleep illnesses often involved mixed amphetamine salts or other amphetamines that makes it even more difficult for those children so treated to sleep. During early childhood, daytime activity spawns proliferating synaptic connections, but in later childhood, those synapses get pruned during sleep. That is one key function of healthy sleep. Clearing toxic metabolic debris from the brain is another. Not only is the amount of children’s sleep declining, but also the pattern of sleep is becoming more irregular, leading to circadian disruption. Light exposure is playing a key role (especially, between dusk and sleep). The blue-enriched light of a smartphone is delaying the brain’s perception of “night” and extending the “pre-dusk” energy surge that we’ve evolved naturally. The lower intensity, incandescent reading lights of the past produced longer-wavelength light with a lesser effect on the internal clock. A recent study, comparing the light effects of reading from an iPad and reading from a printed book, found that the light is much more intense when one is reading from a light-emitting screen. Falling asleep with the phone on brings other sleep disruptions into play. Devices’ vibrations/notifications disturb sleep, and “phone checks” during nighttime waking episodes jolt the system and interrupt the melatonin cycle through light exposure. Meta-analysis of 67 studies supports the proposition that such screen usage is associated with decreased sleep duration and increased prevalence of sleep disorders. 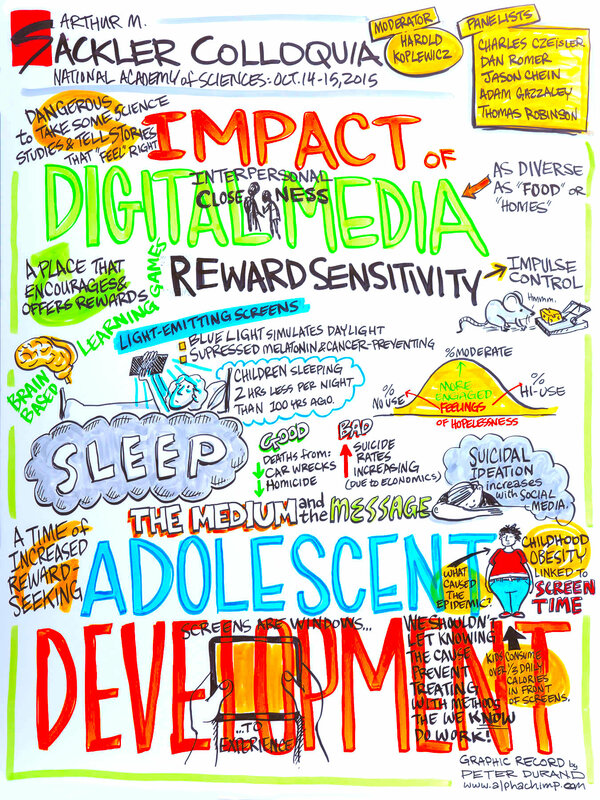 To what extent are depression, anxiety, and risky behaviors in adolescents an actual result of media use, and which children are most susceptible to these kinds of outcomes? One way to answer that question is to look at that age group’s health outcomes over the last ten years, since that’s been a period of increased connectivity. Whatever is happening with this “digital revolution”, and with the possible exception of obesity, it’s hard to see major impacts on important outcomes (fatality rate, motor vehicle fatality rate, suicide rate, homicide rate, adolescent birth rate, drug use, serious emotional or behavioral difficulty). Basically, kids are doing better than they were before the digital revolution. Nevertheless, there is a lot more we can do to reduce adverse effects of mental health problems and risky behavior in today’s youth. A national longitudinal study several years ago found TV viewing associated with deteriorating academic performance. In contrast, book reading (of any kind) was associated with higher GPAs and more club participation. Medium Internet use (1-4 hrs./day) was associated with more engagement with sports and clubs, but more Internet use than that was associated with a sharp decline of both those activities and a rise in hopelessness (which soared as study subjects’ daily Internet use rose beyond 5 hours). Heavy video game playing also was associated with a hockey stick trend toward increased hopeless. Anything that contributes to both hopelessness and hostility or suicidal ideation demands close attention, especially in light of recent, tragic events. Content matters greatly. It is more of a factor than the device through which it’s accessed. For that reason, researchers need finer categories to describe where kids are going online and what they’re doing there. Among the things that we know is that adolescence is a period of heightened reward seeking and heightened reward sensitivity. This is especially true when adolescents are among their friends, when their environment affords opportunities for social rewards, and when they’re confronted with immediately available rewards. Response to reward changes in adolescent brains. Right before puberty, there’s a massive reorganization, and a new expression of dopamine receptors. This changes how adolescents perceive opportunities for reward. Neuroimaging studies reveal that the parts of the brain where dopamine’s being expressed and to which it’s being distributed become more active as adolescents either anticipate or receive rewards. 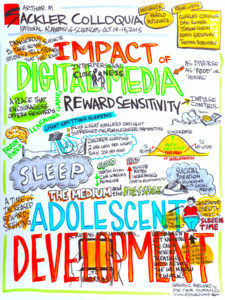 If we know that teens are more sensitive to rewards, and we know that digital media offer opportunities for social, salient, and immediate rewards, then we can speculate that teens are especially prone to becoming invested in these technologies (and more susceptible to their adverse effects). This is an appealing story, but there’s very, VERY little data (especially, little direct data). The narrative is just constructed from “points of contact” borrowed from the scientific literature, from intuition, and from common sense. What’s the latest research on adolescent use of online and video games to promote positive health outcomes? Is there any research comparing these outcomes to other teaching and play modalities? Are there any neuroscientific, psychological, social, or cognitive advantages or disadvantages of playing video games to promote desired health outcomes? Action games (which are immersive, present substantial interference, demand high attention, and offer high rewards) are associated with several positive cognitive control effects. Among these are resistance to distraction, attention, working memory, and task switching. Games that involve both digital and physical play (such as the Wii and Connect games) also seem to contribute to some positive health outcomes. Research is being done to validate the constructive elements of game design, and to improve the ability to identify and optimize the transfer of those design elements from the laboratory to the real world. This effort is intended to transform game technology from a content delivery system into a capacity-building system. What are the mechanisms that link screen time with obesity? Are there any effective solutions to limit the effect of screen time on obesity? Screen time is one of the best-documented causes of obesity in childhood and obesity is one of the best-documented effects of screen time in childhood. Four real-world, randomized, controlled trials on pre-school through middle school children, with interventions to reduce screen time (in school or at home), produced reduced weight gain. Depending on the interventions, the tested amount of reported screen-time reduction was between 2/3 and 3/4 of the control population’s usage level. Measuring the effect is hard. Obesity is measured more accurately than screen time, and the screen behaviors of study cohorts change over time. That’s why controlled studies are indispensable. They allow investigators to control for the other influences on obesity among their subject populations. The mechanisms through which screen time reduction influences obesity have yet to be identified. Surprisingly, reducing screen time does NOT measurably affect physical activity. Regarding sleep, there’s good evidence that screen time harms sleep, and there are both epidemiological and laboratory data that less sleep leads to weight change; however, it’s not yet established that screen time’s effect on weight is mediated through sleep effects. The trials discussed here did not control for the effect of sleep. There is evidence, though, that screen time affects calorie intake. Marketing and advertising, which have been shown to affect both food preferences and food intake, may be the mechanism at work here. Also, in randomized controlled trials, there’s a reduction in calorie intake between the treatment and control groups. Eating while viewing is a key mechanism. Studies show that kids across the socioeconomic spectrum consume about one-third of their calories in front of a screen. Lab research shows that eating while distracted leads to higher consumption. Taken together, these behaviors constitute a pattern of eating while focused on the screen (rather than on the food), and therefore, eating without much regard for quantity or satiety. Unfortunately, all of these studies preceded the rise of mobile computing. The same pathways may be found in front of small screens as in front of larger ones, but that remains to be determined. The speaker took a provocative stance on this point. He proposed that (i) how we got here is not that interesting, because that world no longer exists, and (ii) he’s willing to find what works first, and figure out the mechanisms later (or not at all). This seems to epitomize the type of research, without a theoretical foundation, that Patti Valkenburg criticized in her remarks. Another speaker pointedly noted that proliferation of studies that are just “shots in the dark”, and thus, failures. What should pediatricians be telling families about this? Every tested intervention involved setting a limit. The 3-6-9-12 Guidelines described above are one possible approach. Another panelist endorsed a seven-hour weekly screen time allowance, just because kids can grasp the idea of an hour a day. There seems to be no lower limit on the effectiveness of screen time reduction. That is, however little screen time the child had before, reducing it still seems helpful. Note: An audience member (Justine Cassell of Carnegie Mellon) offered provocative remarks at the end of this panel. They are worth paraphrasing: A screen is not a thing. A screen is just a window to an experience. 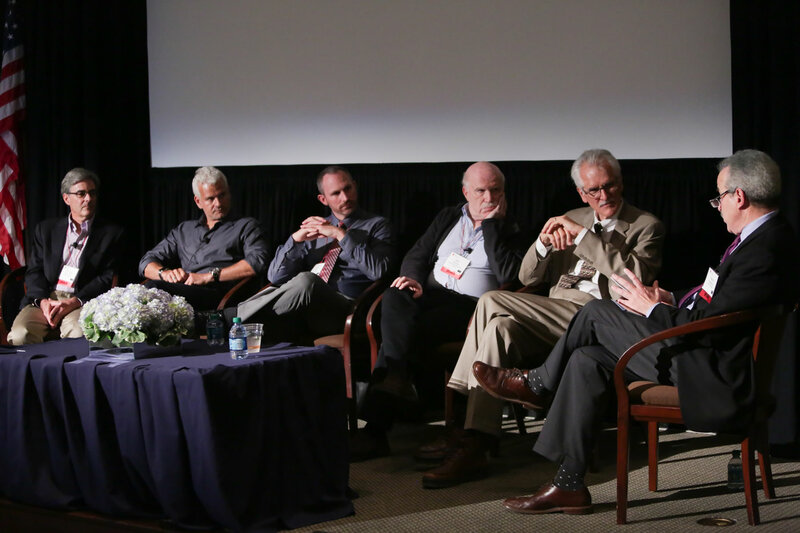 The conversation on this panel – equating TV and computers, computers and iPads, iPods and cell phones, phones and smart watches – dates the people at this conference. These things are NOT the same for the age group in question. She believes deeply in the importance of the sociocultural infrastructure of learning, which can be lost in MOOCs and hybrid classroom. She challenges Turkle’s suggestion that only face-to-face interaction can do the job, since then Skype would be a sufficient substitute, and online lectures would have the same impact as live lectures. That doesn’t seem to be the case. The capacity for interpersonal closeness must be maintained because it is a defining attribute of what it means to be human. This day of the conference has involved a lot of “blunt-edged thinking”, but this panel was very diverse and nuanced. Lots of complexity is being lost (exact age group, exact device, how long used, what uses, etc., all matter). The focus on “media” is misplaced, because media are channels between people, and it’s up to “us” what gets carried in those media. “No technology is inherently good or evil, but you can certainly do evil things with all technology, including a pencil, and you can do good things with all technology, including a pencil.